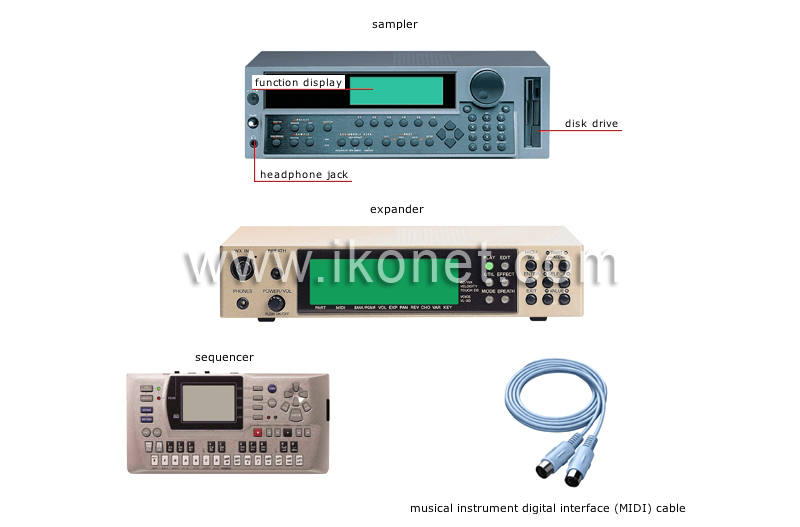 Electronic instruments are designed to imitate, convert or produce sounds based on electric signals and digital data. Component that digitizes and stores sounds based on recordings of various acoustic sources, and reconverts them into sound signals. Device used to read or record data on a diskette. Liquid crystal display indicating various data. Slot that takes the plug from the headphones. Component used to record, read and change MIDI data, the digital data used to create electronic music. Synthesizer used to produce sounds based on digital data transmitted by a keyboard, a sequencer or a computer. Cable connecting two MIDI instruments; the MIDI interface is used to transfer digital data and electric signals.